Special and preferential rates outside school on request. Chalet ideally located, with its very central position of the ski area and its very easy access. Summer hiking trails in the immediate vicinity, and all activities. 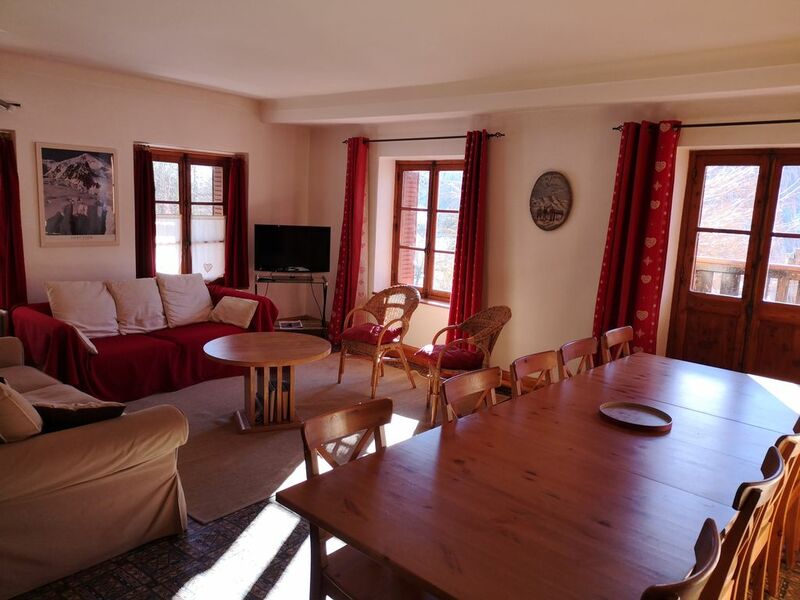 You will appreciate the space, the authenticity, the charm and the panoramic sight on the massifs for this CHALET in DUPLEX with SOUTH balconies in a country house of character. In the immediate vicinity of the slopes of "Serre Chevalier 1400" with the departures of the Aravet-Villeneuve (900m): free practical shuttles are nearby to access the site in 4 'and two stations (rental companies can also keep your material). Station La Chirouze, blue circuit. In a sought after and quality place, authentic chalets and houses of La Salle les Alpes: 'La Chirouze'. Very good exposure because on the sunny side. Not overlooked. Access is independent and walk-by enclosed garden of 300 m2, the environment is quiet and bucolic summer (forest, garden). Tobogganing and snow games in winter. Very pleasant, spacious cottage scrupulous facility, upon entry a wooden atmosphere creates a cozy mountain atmosphere. You will enjoy a large sunny living room with a wood burning stove (wood provided), a large independent and comfortable kitchen with new appliances and qualité.De real big rooms in the spirit mountain. Ideal for families, backpackers, young couples, sport. All activities nearby. All household products are provided. Linen not provided but possibility of renting complete packs in Villeneuve. Ground floor, bathroom with hip bath, washbasin. Separate toilet. On the first floor level of the rooms: bathroom wood siding with shower, sink and toilet. Ground floor wood cladding for: entrance (10 m2), independent kitchen (15 m2) equipped with a SMEG cooker 5 fires. SMEG refrigerator and BOSCH dishwasher, Brandt washing machine. Lounge (30 m2) wood stove. TV, stereo, 2 sofas including a convertible 160, dining table and chairs, rattan armchairs, coffee table. View South East mountain and garden to the living room, kitchen garden view. A much older and more tucked-away chalet than the publicity suggested with elegant views all around and one's own garden. But still just a stroll to the Navette or up into the old village with its 12th century church and 16th century chapel. Well appointed kitchen with a great cooker and every conceivable implement - even a giant teapot for us sad Brits. And a free supply of dry wood for the very effective wood burner. Good sized bedrooms with sinks that alleviated some of the morning rush for the bathroom. Probably the only thing in (mildly) short supply were loos (just 2, one of which was in the main bathroom and the other on its own with no sink). All in all, a really characterful house and much loved by all of us. Navette à 2 minutes, chalet partagé mais accès à l'arrière personnel. Spacieux, bien équipé, propriétaires à l'écoute. Bon séjour. Chalet à la hauteur de la description. Chalet bien décrit dans la présentation. Tout y est. Je recommande. Nous avons passé un magnifique séjour à la montagne. Le chalet est splendide, décoré avec goût, disposant de tout le confort nécessaire et bien plus encore (jardin, entrée sécurisée etc.). L'emplacement est idéal; le chalet offre le calme de la montagne et l'accès facile aux pistes de ski; à 10min à pieds des pistes et à une minute à pied de la navette autobus gratuite menant aux pistes. Les propriétaires sont à l'écoute et une réelle confiance s'est de suite installée. Un très bon séjour aux pieds des pistes. Nous n'hésiterons pas à revenir. Nous avons passé un séjour très agréable. Le chalet est très confortable, la salle de vie est très sympathique et chaleureuse. Navette pour les pistes à 50m, et à 5min de la station. Nous avons passé une semaine très agréable dans ce chalet tout confort et convivial. Les navettes, très pratiques, pour aller au pied des pistes rend la localisation encore plus appréciable. 25/100 à la réservation.Le ménage est un ménage de fin de séjour, le Chalet devant être rangé, appareils et autres vidés.